Note that the workout on Wednesday is at AMERICAN UNIVERSITY due to a conflict at BCC. With any luck, this will be the last time we have to move practice this spring. The gun will go off at 7:15 as usual. Some maintenance work is in order. The men will do 6 x 1200 with a 3:00 rest. The A group will 2 @ 75s, 2 @ 73s, 2 @ 71s. The B group will do 2 @ 80s, 2 @ 78s, 2 @ 76s. Several of our athletes are running at the Maryland Twilight track meet this Thursday, May 3. The 800 meters, the first event we will participate in, is scheduled for 6:30 pm. The 1500, the feature event of the evening (at least as far we’re concerned), is scheduled for 8:05 pm. If you can, come on out and support the gang. If you haven’t already done so, mark your calenders for the end of season happy hour/party on May 26th in Bethesda. I owe many of you free drinks for the Cherry Blossom inter-squad race, and since I have no idea who was on the winning team, it won’t be difficult to finagle a couple of drinks out of me even if you were out of town for Cherry Blossom. Have we just lived through the greatest 4 days in GRC history? Track scholars will debate that question for years to come, along with the related question of whether we sent them. While I’m not qualified to opine on such weighty matters, I know for sure that we had an amazing weekend. In fact, there were so many great performances that I’m surely going to miss a few that should be noted and celebrated, and for that I apologize in advance. With that introduction, I present my take on the highlights of the weekend. Sam’s 29:37.12 at Penn Relays. This was, without a doubt, the best performance by a GRC athlete in the 18 months that I’ve been with the team. Sam ran a 36 second PR, which is phenomenal at this level. Equally impressive was the way he ran, which was with patience and confidence. Sam’s plan was to go through 5k in 15 minutes, and then start racing, and he executed the plan perfectly. Rather than panic when the leaders took it out faster than expected, Sam had the confidence to wait to make his move, and ran a huge negative split. This was the kind of run that will propel Sam to the national class level within the next two years. Drea’s 35:46.79 at Penn Relays. In any other week, Drea’s huge PR would have taken top billing. To put her race into perspective, two weeks ago, Drea’s 5k PR was 17:50. On Thursday, Drea went through 5k in 17:44, and kept right on rolling. In the last six months, Drea has run PRs at every distance from 5k to the half marathon, but this was surely the best race of her career. As she fought through the last mile despite being totally spent from the early pace, Drea showed the kind of toughness that has made her into a truly elite athlete. Witty’s 14:40.41 at Penn Relays. Going into the race, Witty thought of himself as an 800-1500 runner. After he crossed the finish line and looked up at the clock, Witty started to realize that he is a distance runner in the making, as he is starting to see the benefit of the strength training he has been doing since joining the team in the fall. Closing in 30 for the last 200 was impressive indeed, and with another year of mileage under his belt, Witty will be able to finish that fast off of a much, much more aggressive early pace. LTO’s 35:51 at Pikes Peak. Laura ran her first PR in seven years, and it was well-deserved. Having been ranked in the top 10 in the nation in the steeplechase twice during her career at Stanford, Laura set the bar awfully high for herself, but she’s now ready to get in the habit of running PRs regularly. Karl’s 30:05 at Pikes Peak. Like LTO, for Karl to run a PR says a whole lot, since he is the greatest distance runner in Columbia University history. This was a road PR, and could have gone much faster had he not been solo most of the race. After missing the Olympic Trials dues to bad weather in Chicago, Karl had a tough few months dealing with injuries and illness, but this performance bodes very well for the rest of the spring, and beyond. Lindsay’s 35:54 at Pikes Peak. In her GRC debut, Lindsay ran a very solid race, considering the fact that she’s been training for about a month. Talk about setting a high bar, Lindsay was a 6-time All-American at Yale, and after four years away from competition, she is ready to get back into it. That the GRC debut of an athlete of this caliber is not the headline speaks volumes about the quality of the performances this weekend. Jake’s 31:32 at Pikes Peak. Jake is back close to his pre-injury level. If he can stay healthy, he’s going to get back in the business of running PRs in the next few months. Dave Wertz’s 31:58 at Pikes Peak. This was yet another milestone for Dave, as he broke 32 minutes for the first time. Dave may not talk much, but he keeps getting better every race. Beth’s 36:11 at Pikes Peak. Beth has continued to run at a level that would have been unthinkable for her even a few months ago. Coming into the spring, Beth had never broken 18:30 for 5k or 37:30 for 10k. Beth continues to show fantastic range, and she will set her sights on significant PRs at the half marathon and marathon later this spring. Susan’s 36:23 at Pikes Peak. Susan ran a 17 second PR, despite nearly breaking her ankle in the warmup. Susan is continuing to make a successful transition to longer races, and the strength she is building now is going to pay huge dividends in the future. Lauren’s 37:28 at Pikes Peak. Lauren ran her second huge PR in the last 8 days. After only a few weeks of training with GRC, Lauren has obliterated her previous PRs at numerous distances, and she’s only getting started. Dickson’s 32:31 at Pikes Peak. Dickson is trying to rebound from the disappointment of Boston, and this was certainly a step in the right direction as he prepares for the Cleveland marathon. Read Dickson’s excellent account of his less-than-ideal Boston debut here. Murph’s 33:26 at Pikes Peak. 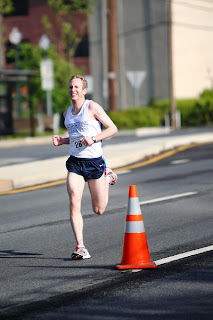 Murph is another of our Boston refugees, and he is going to give it a go at the Frederick half marathon this weekend. He ran Pikes Peak as a workout, and his very strong finish is a hopeful sign. Congratulations to everyone for a truly historic weekend. More great performances await this spring and beyond, and I, for one, can’t wait to see what we can do!